ESA global astrometry mission (European Space Agency), scheduled for launch in 2013. 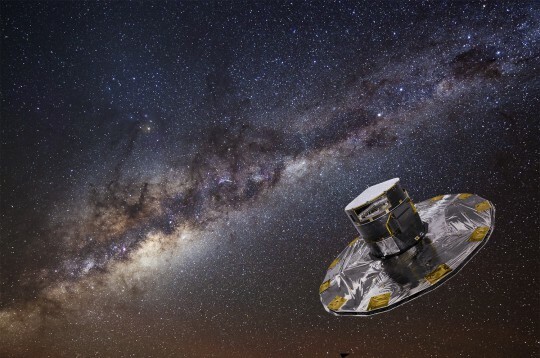 At its heart, Gaia contains two optical telescopes that can precisely determine the location of stars and split their light into a spectrum for analysis. The spacecraft itself can be divided into two sections: the payload module and the service module. The payload consists of the telescopes and three instruments. The service module contains the propulsion system, the communications units and other essential components that allow the spacecraft to function and return data to Earth. Beneath the service module and the payload module is the sunshield and solar array assembly. The payload module is housed inside a geometrical dome called the ‘thermal tent’. Inside are the two telescopes, each consisting of three curved, rectangular mirrors, a beam combiner and two flat rectangular mirrors. The largest mirror in each telescope is 1.45 m by 0.5 m. The two telescopes focus their light onto the focal plane, which features three different zones associated with the science instruments: Astro, the astrometric instrument for detecting and pinpointing celestial objects; the Blue and Red Photometers (BP/RP), used to determine stellar properties such as temperature, mass, age, elemental composition; the Radial-Velocity Spectrometer (RVS), used to determine the velocity of celestial objects along the line of sight. Each instrument uses a set of Charge Coupled Devices (CCDs) as detectors. This information will all be combined to give a three-dimensional picture of how each celestial object is moving through space.